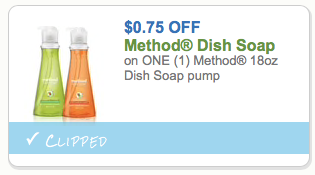 *RARE* Method Dish Soap Coupon – Print now! It’s been years since we’ve seen a printable Method coupon, so I’m excited to see this new Method dish soap coupon! You can print 2 copies of this coupon per device, including mobile. I’d recommend printing it right away as this will be a popular coupon. Target sells Method dish soap for $2.99, so $2.24 after coupon!